© 2018 Daulay et al. Mothers who have children with special needs are prone to parenting stress due to the limitations of the children. This study aimed to test the contributions of hardiness, social support and child’s maladaptive behaviors as mediated by parenting sense of competence to parenting stress in mothers of children with special-need. The participants of this study were 256 mothers. Five variables used were hardiness, social support, child’s maladaptive behavior, parenting sense of competence, and parenting stress, which shaped the structural model of the study. The data of this study were analyzed in two stages, using a structural equation modeling to assess a full model and post-hoc analysis to assess the differences of parenting stress based on types of the children’s disabilities. The results: 1) parenting stress was directly influenced by hardiness, social support, child’s maladaptive behavior, and parenting sense of competence; 2) The relationship between hardiness and parenting stress was mediated by parenting sense of competence; 3) the mothers having children with autism spectrum disorder went through parenting stress higher than those raising children with other types of special need. The importance of parenting sense of competence as the mediator variable is discussed The determinant of parenting stress is directly affected by a child’s maladaptive behavior that has a positive correlation with parenting stress. The hardiness and parenting sense of competence as mother’s internal strength has a negative correlation with parenting stress, and so do the social support as external strength. Keywords: Parenting stress, Social support, Hardiness, Parenting sense of competence, Maladaptive behavior, Autism. condition of a mother certainly then makes the growth of her child less optimum [5, 6]. Given that the issue of parenting stress is very important, this study has tested some variables supposedly determining the surfacing of parenting stress in mothers having children with special needs. The number of children with special needs in Indonesia keeps increasing year by year. According to the latest data, there are 1.544.184 children, with 330.764 of them (21.42%) are in the age range of 5-18 years old . Consequently, it is necessary to have more caretakers for protecting and helping these children grow. The caregivers’ preparedness and availability is the key to success for parents to stay happy in taking care of their children and to avoid stress. This study focused on testing the stress experienced by the mothers, considering that in Indonesia the role of mothers in taking care or their special-need children is more intensive than fathers who work outside home to meet their families’ economic needs. This common picture of fathers’ inavailability is always proved with their most frequent absence in parents’ meeting at their children’ schools. The fathers of the special-need children involved in this study very rarely attended three-monthly meeting at their respective children’s schools. According to the headmasters, the low rate of their presence was due to the time of their works that they could not leave their works. The number of children cared for by his father is also small, which is around 40% in the community we studied. Only a few of them could attend. Therefore, this study specified the parenting stress based on the mothers’ perceptions, and tried to test deeper the psychological condition of the mothers in parenting their special-need children. The limitedness of every child with a special need can bring a heavier load of parenting or difficulties in their mothers. The importance of mothers’ role has also been studied by Calzada, Eyberg Rich and Querido . Mothers’ parenting role is more intensive than that of fathers so that they get more tired physically and psychologically , and parenting stress experienced by mothers is stronger than that by fathers [10, 11]. Previous studies revealed that the sources of stress experienced by mothers who have children with special needs can be categorized as internal and external factors. The internal factors include: 1) mother’s perception of her child’s condition ; 2) mothers’ negative feelings such as depression ; anxiety [14, 15]; doubt of her child’s future ; 3) strength in coping with stress sources ; 4) negative public stigma of child with special need [18-21], which generates shame of having child with special need ; 5) personality ; hardiness is a personality character, which consists of a set of attitudes resulting in strength in coping with stressing life events ; 6) Individual’s personal resources . The external factors include: 1) low social support to mothers of children with special needs ; 2) children’s limitedness such as children’s dependence on parents , low capability of communicating their requests , increasing maladaptive behaviors of children [29-32]; incapability of controlling their emotions ; 3) high cost of fulfilling children’s needs . This study examined the extent of parenting stress gone through by mothers taking care of children with different disabilities i.e. hearing impairment (deafness), autism spectrum disorder, Down syndrome and intellectual disability. The types of disability children have shown their development disorders from different perspectives. Children with deafness are those unable to hear any sound since birth so that this study tried to explain about the parenting weight borne by mothers who have children with such disability. This limitedness impedes the children’s social and intellectual development, speech and language mastery, and educational achievement , so that it can generate stress in the mothers . Parenting complexity is also experienced by mothers who have children with intellectual disability and Down syndrome. Children with these disabilities demand more attention and tend to depend on other people because their intellectuality is below the average of children in general . In addition, their adaptive skill is also poor , and so is their ability to master social skill . The problems of nurturing children with disabilities positively correlates with the surfacing of parenting stress [39, 40]. Mothers who have children with autism spectrum disorder also experience parenting stress. It is characterized by deficits in social interaction and communication, and the presence of restricted and repetitive behaviors . One of the causes of parenting stress is the characteristics of autistic children such as the inability to interact with their environments , inability to control their emotions , increasing maladaptive behaviors like tantrum, self-harm , and problem with sensory integration . Studies have consistently proved that the intensity of parenting stress is higher in parents who have children with Down syndrome , intellectual disability , hearing impairment , and autism spectrum disorder  compared with those having children with normal development or with those having children with chronic medical conditions . In addition, mothers who have autistic children are believed to experience parenting stress higher than mothers who have children with other types of development disorders . Given the different characteristics of disabilities, it was assumed that the dynamics of theories influencing mothers of children with special needs are also different. So, this study aimed to test a model that explains the correlation between several variables and parenting stress gone through by mothers of children with special needs; to test the role of parenting sense of competence as the mediator variable and to find out which one of the four disabilities can lead to parenting stress most. The hypotheses for this study are: social support has a direct effect on parenting stress (Hypothesis 1); social support has an indirect effect on parenting stress through parenting sense of competence (Hypothesis 2); hardiness has direct effect on parenting stress (Hypothesis 3); hardiness has an indirect effect on parenting stress through parenting sense of competence (Hypothesis 4); perception of child’s maladaptive behavior has a direct effect on parenting stress (Hypothesis 5); perception of child’s maladaptive behavior has an indirect effect on parenting stress through parenting sense of competence (Hypothesis 6); parenting sense of competence has a direct effect on parenting stress (Hypothesis 7); and parenting sense of competence correlates negatively with parenting stress (Hypothesis 8). The participants of this study were 256 mothers, consisting of 97 mothers of children with intellectual disability, 46 of children with deafness, 49 of children with down syndrome, and 64 of children with autism spectrum disorder. Other criteria of the participants were being the biological mothers of the children, raising their children by themselves, and not sending them to dormitory schools special for disable children. Prior to collecting data, the researchers developed a rapport with the parents through the facilitation of the schools the children went to. There were six public and private Special Needs Schools in Yogyakarta, which were willing to participate in this study. Every subject of the study signed the informed consent as the evidence of their willingness to participate voluntarily. The procedure of collecting data used in the study had complied with the standard determined by the Research Ethics Committee of the Faculty of Psychology, Gadjah Mada University. The scales were presented directly to the participants in the parenting activity at schools. Before the activity, they were asked for their willingness to participate in this study by answering on the scales. The researchers guided them during the process of giving their responses on the scales in case they could not understand the items. To measure the social support, hardiness, parenting sense of competence, and parenting stress, analysis of psychometric properties was done by testing the exploratory factor analysis and confirmatory factor analysis on the subjects of the study. The result showed empirical evidence that supported the validation and reliability of each construct, and so, the four measures can be applied on the mothers of children with special needs . The Social Support Scale used in this study was based on the types of social support defined by Sarafino and Smith . The mothers reported on the four types of social support; Emotional or esteem support (8 items; for example: ‘Support from fellow mothers can strengthen me to stay motivated in taking care of my child’); Tangible or instrumental support (4 items; for example: ‘My relatives help me raise fund to meet my family’s needs’); Informational support (4 items; for example: ‘I get childcare information from the mother’s community”); Companionship support (6 items; for example: ‘My friends can spare their time for me’). This scale contained 22 items with 5 alternatives of answer ranging from 1=very dissatisfied to 5=very satisfied. This social support scale had been tested and the internal consistency reliability was Cronbach’s α = 0.842. The Hardiness Scale used in this study was based on three dimensions of Hardiness Theory by Kobasa . It consisted of three subscales i.e. Control, Commitment and Challenge. There were 18 items with 5 alternatives of the answer, ranging from 1 = strongly disagree to 5 = strongly agree. An example of hardiness scale is ‘I will immediately get up from the problem I am facing’ (Control, 8 items); ‘I try to get involved in every activity my child does’ (Commitment, 4 items); ‘I am able to anticipate any change happening in my child” (Challenge, 6 items). The reliability value of hardiness scale was Cronbach’s α = 0.783. To measure the mothers’ perceptions of the severity of internalizing and externalizing maladaptive behaviors of their children, a scale adapted from the Vineland Adaptive Behavior by Sparrow, Cicchetti, Balla, dan Doll  was used. A total of 21 questions with a 3-point scale, ranging from Never (0 point) to Usually (2 points) were included in this study, and the whole item was unfavorable. An example of the items of the perception of the maladaptive behavior of children in the internalizing dimension was “Avoidance others and prefers to be alone”, and in the externalizing dimension was “Is impulsive”. For the sample of this study, the reliability (Cronbach alpha) of the Maladaptive Behavior Index-Vineland Adaptive Behavior Scale was 0.856. The Parenting Sense of Competence scale used in this study was based on the dimensions of parenting sense of competence formulated by Johnston dan Mash , which consists of parenting efficacy and parenting satisfaction. The scale contained 24 items with 5 alternatives of answer ranging from 1 = strongly disagree to 5 = strongly agree. The example of parenting sense of competence for the dimension of parenting efficacy was ‘I believe I am able to meet my child’s needs’ and the other for the dimension of parenting satisfaction was ‘I am happy with my life as a parent’. The internal consistency reliability for the parenting sense of competence scale was Cronbach’s α = 0.862. The Parenting Stress Scale used in this study was based on Abidin’s Parenting Stress Index (PSI) . This scale has 26 items with 5 alternatives of answer ranging from 1=strongly disagree to 5=strongly agree, and it consists of three subscales: Parental Distress (12 Items; for example, ‘I feel guilty for the disability my child has’), Difficult Child (8 items; ‘My child’s capability is below that of his/her peers’) and Parent-Child Dysfunctional Interaction (6 items; ‘My child rarely do things that make me proud’). The internal consistency reliability in the current sample was Cronbach’s α = 0.813. The data of this study were analyzed in two stages. Firstly, using a Structural Equation Modeling, the theoretical model proposed by the researchers was tested to find out whether it was supported by the data and how well it fitted the index of model conformity. The value of goodness of fit was based on: 1) absolute fit measures , which consist of the Goodness of Fit Index (GFI) and Root Mean Square Error of Approximation (RMSEA); 2) incremental fit measure , which consists of the Comparative Fit Index (CFI), Relative Fit Index (RFI) and Tucker Lewis Index (TLI). The match rates tolerated by GFI, CFI, RTI and TLI range above 0.90  and the value of RMSEA is accepted if it is less than 0.08 . The model test was done to bring about the values of correlation, direct effect, indirect effect between the exogenous variables and endogenous variables, and to test the total effect and mediator variable. Mediation analysis  was done to find out the indirect impact on social support, hardiness and children’s maladaptive behaviors through parenting sense of competence toward parenting stress. SEM analysis and mediation analysis made use of Lisrel 8.8 software. Secondly, using ANOVA, it tested whether the mothers’ parenting stress were influenced by the four types of disability, and using Tukey post hoc analysis, it determined the different extent of parenting stress caused by each type of disability of the children. Based on the demographic data of the research subject, it was obvious that the age of most of the mothers ranged from 18 to 40 years old (57.8%), meaning that the subjects were still at productive ages. Regarding their education level, 47.26% of them had finished high school. Based on demographic data of children with special needs, most of the children were at the ages of 7-13 years old (52.73%) and boy (70.70%). The number of mothers having children with intellectual disability was bigger than those with other three types of disabilities (37.89%). 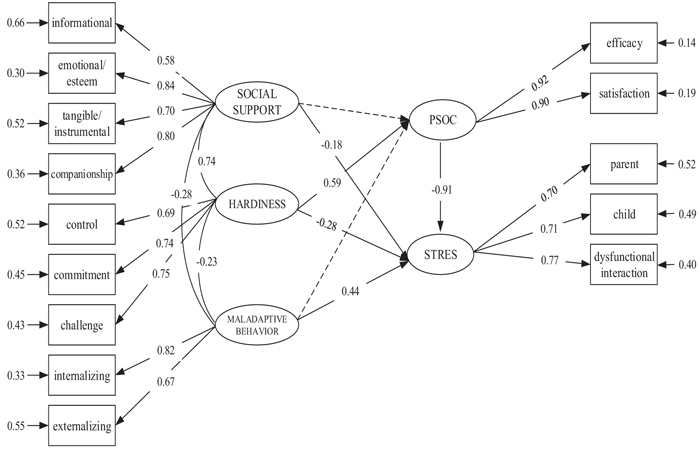 The correlation of social support, hardiness, and perception of children’s maladaptive behavior through the mediation of parenting sense of competence with parenting stress was tested using structural equation modeling and modeling Maximum Likelihood (ML) technique . The model of this study met the requirement of the proposed fit model, and by GFI = 0.91, CFI = 0.97, RFI = 0.93, TLI = 0.96, and RMSEA = 0.075, the result of the goodness of fit of the parenting stress model was good. To answer the hypothesis, based on the standardized final model Fig. (1), the significance of the parameter is estimated to provide important information about the relationship among the latent variables. The limit for reject/accept a relationship with the level of significance of 5% is 1.96 . Based on Fig. (1), it is shown that the t-value is higher by 1.96 or lower by -1.96, so the hypothesis is significant and accepted. The standardized parameter estimates for the final model is shown in (Fig. 1). Fig. (1). Standardized final model. This result indicated that the hypothesized model fit the data well. The final model accounted for 34% of the variance in parenting sense of competence (R2 = .34, p < 0.05), and 92% of the variance in parenting stress (R2 = .92, p < 0.05). Table 1 shows that 1) the effect of social support on parenting sense of competence by β=0.09 (t < 1.96) was not significant and the hypothesis was rejected; 2) the effect of social support on parenting stress by β=-0.18 (t < -1.96) was significant and the hypothesis was accepted; 3) the effect of hardiness on parenting sense of competence by β=0,59 (t > 1.96) was significant and the hypothesis was accepted; 4) the effect of hardiness on parenting stress by β=-0.28 (t < -1.96) was significant and the hypothesis was accepted; 5) the effect of perception of child’s maladaptive behavior on parenting sense of competence by β=-0.10 (t > -1.96) was not significant and the hypothesis was rejected; 6) the effect of perception of child’s maladaptive behavior on parenting stress by β=0.44 (t > 1.96) was significant and the hypothesis was accepted; 7) the effect of parenting sense of competence on parenting stress by β=-0.91 (t < -1.96) was significant and the hypothesis was accepted; 8) the parenting sense of competence evidently correlated in a negative way with parenting stress (r = -0.67, p < 0.01). Table 1. Regression weights of the final study model. The parenting stress model Fig. (1) tested the role of parenting sense of competence in mediating hardiness on parenting stress, yet not mediating social support and perception of child’s maladaptive behavior. The direct effect of hardiness on parenting sense of competence by β=0.59 (t > 1.96) was significant and it had covariance value higher than the direct effect of hardiness on parenting stress by β=-0.28 (t < -1.96), although hardiness had a significant effect also on parenting stress. It proved the hypothesis that parenting sense of competence mediates the effect on parenting stress could be accepted. The direct, indirect and total effects of each exogenous variable on the endogenous variables can be seen in Table 2. Table 2. Standardized direct, indirect and total effects for parenting stress. Based on Tukey post hoc analysis, the mothers of children with autism spectrum disorder went through parenting stress higher (n = 64, M = 49.21, SD =7.49) than those of children with other types of disorder (intellectual disability n = 97, M = 33.92, SD = 10.77); (hearing impairment, n = 46, M = 33.02, SD = 10.58); (down syndrome, n = 49, M = 29.57, SD = 11.75). This discrepancy was evidently significant (F (3,252) = 44.236, p< 0.01). The value of the adjusted R squared 0.337 indicated that the variability of parenting stress that could be explained with the variability of types of the children’s disabilities was 33.7%. Based on the severity of the mothers’ parenting stress, this study answered the question that mothers who have children with autism spectrum disorder go through worse parenting stress than mothers who have children with other special needs (intellectual disability, hearing impairment, and down syndrome Table 3). Table 3. ANOVA to determine significant differences between types of disabilities with parenting stress in mother. This study was done in Indonesia, involving subjects who were mostly Muslims (70.3%), Christian (21.3%), Hindu (2.6%), Buddhist (5.8%). The role of religion is believed to be beneficial in shaping parents’ personality with hardiness and parenting sense of competence for nursing children with special needs because they can minimize mothers’ parenting stress. The results of this study correspond with the results of other similar studies, proving that the internal factors within mothers such as hardiness , and parenting sense of competence [57-59] have a negative correlation with parenting stress. On the other hand, the external factors like mother’s perception of social acceptance and support have a negative correlation with parenting stress [60, 61], and mother’s perception of child’s maladaptive behavior has a positive correlation with parenting stress [5, 62]. The external source of stress is the mother's perception of the maladaptive behavior of children with special needs, such as being less able to express what they want ; being unable to interact socially [63-65]; being less independent ; disruptive behaviors such as aggression, tantrums, and difficult temperaments of repetitive behavior and stereotypes . The study also proved that the maladaptive behaviors displayed by these special-needs children have a significant impact on parenting stress [9, 36, 68-70]. As significant defense from the emergence of parenting stress, the contribution of social support is prominent in Indonesian societies due to their collective culture that accentuates family relation, cooperation, solidarity, and interdependence. Social support for mothers who have children with special needs is beneficial because it enables them to reduce mental problems such as stress and depression , to increase their coping ability and psychological well-being [44, 63], to make them get closer to their children [26, 64]. The results of this study showed the importance of parenting sense of competence as the mediator variable. The rate of parenting sense of competence affects the way a mother perceives and feels the condition of her child so that it can minimize her stress. If she perceives her child’s limitedness positively, the interaction between her and her child will be able to go better. Consequently, the child’s development can be optimum . The mother’s perception of her competence in taking care of her child has a direct correlation with the use of effective parenting strategy . Several studies have proven the importance of parenting sense of competence as a mediator variable on parenting stress [52, 58, 59, 72, 73]. This study supports Mash and Johnston’s model of parenting stress in parents with hyperactive children . This model integrates three domains of characteristics affecting the growth of parenting stress, specifically the characteristics of child, parent and the environment. Child’s characteristics include his/her adaptive and maladaptive behaviors. Parent’s characteristics include their efficacy and contentment of parenting that is able to decrease parenting stress and environment’s characteristics include social support that directly affects the rise of parenting stress. The study done by Hill and Rose  has confirmed the role of parenting sense of competence as a mediator variable. They conducted a study on mothers who had children with intellectual disability, proving that mothers with high parenting efficacy have confidence in their ability to apply effective ways of interacting with their children . This study tried to complete these previous studies by adding the variables of internal strength and self-control for staying well under the pressure of children’s problems. Hardiness is an internal strength that has a sense of control over every pressing incident in life . Based on the purpose of this study, there are differences in maternal parenting stress seen from the type of child disability, proving that mothers who have autistic children experience higher parenting stress than mothers of other special needs children. The result of this study confirms the results of meta-analysis study done by Hayes and Watson that parents of children with autism spectrum disorder experience parenting stress higher than parents of developmentally disorder children and parents of developmentally normal children. According to Karst and Hecke , autism spectrum disorder constitutes a developmental disorder that is severe because a child with autism goes through setback in almost entire aspects of development. Difficulty in raising a child with autism generally is due to the characteristics of the child who tends to self-harm and be hyperactive ; perform destructive behaviors ; have poor adaptive behavior ; get barriers in communication and social interaction . This study would like to give new information about the importance of internal strength such as hardiness and parenting sense of competence and external strength like social support, which have a negative correlation with parenting stress. On the other hand, the severity of maladaptive behaviors of children with special needs frustrates mothers in taking care of them so that the results of this study succeeded in proving that child’s maladaptive behavior causes the increase of mother’s parenting stress. The role of personality and cognitive assessment, as well as the intensity of social support reception altogether, leads to positive parenting. The importance of parenting sense of competence as a personal resource has been approved in this study that it mediates hardiness to parenting stress. With confidence in personal ability, mothers are able to decrease negative effects; they are able to control the rise of negative emotions (i.e. guilty, anxiety and sadness), to solve the problem, feel comfortable, and eventually to positively perceive the existence of their children and be grateful. The implication of this study is the importance of hardiness and sense of competence in every individual. The abilities of self-control and self-introspection indicate self-functioning which is important in dealing with stress sources and in perceiving every problem. This study has proven that the hardiness and parenting sense of competence play the role as buffers against the surfacing of parenting stress. Therefore, there is a chance to make training for parents on how to build positive thinking for reducing parenting stress; for example, Cognitive Behavior Therapy , and Problem Solving Therapy . The limitation of this study is that the participants were mothers of children with special needs only so that the generalization could not address other main caregivers who also had a significant role in the children’s growth and also other parents of children with normal development. Therefore, based on the results of this study, any following study is suggested to examine the relationship between the variables based on other main caregiver, namely father. Correspondingly, it is important to study more about the relationship between children’s maladaptive behaviors and parenting stress. Any future study is recommended to involve training for parents to reduce parenting stress and to provide them with knowledge about children’s maladaptive behaviors. The study was approved by the Department of Psychology Ethics Committee at Gadjah Mada University. Each participant gave written informed consent. The authors declared no potential conflicts of interest with respect to the research, authorship, and/or publications of this article. We would like to thank all the mothers who participated in this study and the Public and Private Special Needs Schools for facilitating and helping this research. Richman D, Belmont J, Kim M, Slavin C, Hayner A. Parenting stress in families of children with cornelia de lange syndrome and down syndrome. J Dev Phys Disabil 2009; 21: 537-53. Osborne LA, McHugh L, Saunders J, Reed P. Parenting stress reduces the effectiveness of early teaching interventions for autistic spectrum disorders. J Autism Dev Disord 2008; 38(6): 1092-103. Woolfson L, Grant E. Authoritative parenting and parental stress in parents of pre-school and older children with developmental disabilities. Child Care Health Dev 2006; 32(2): 177-84. Gilmore L, Cuskelly M. Parenting satisfaction and self-efficacy: A longitudinal study of mothers of children with Down syndrome. J Child Fam Stud 2012; 18: 28-35. Deater-Deckard K. Parenting stress 2004. Holden G. Parenting a dynamic perspective 2015. Desiningrum DR. Psychology of children with special needs 2016. Calzada EJ, Eyberg SM, Rich B, Querido JG. Parenting disruptive preschoolers: Experiences of mothers and fathers. J Abnorm Child Psychol 2004; 32(2): 203-13. Tehee E, Honan R, Hevey D. Factors contributing to stress in parents of individuals with autistic spectrum disorders. J Appl Res Intellect Disabil 2009; 22: 34-42. [http://dx.doi.org/10.1111/j.1468-3148.2008.00437.x]. García-López C, Sarriá E, Pozo P. Research in autism spectrum disorders multilevel approach to gender differences in adaptation in father-mother dyads parenting individuals with autism spectrum disorder. Res Autism Spectr Disord 2016; 28: 7-16. Jones L, Totsika V, Hastings RP, Petalas MA. Gender differences when parenting children with autism spectrum disorders: A multilevel modeling approach. J Autism Dev Disord 2013; 43(9): 2090-8. [http://dx.doi.org/10.1007/s10803-012-1756-9]. Altiere MJ, von Kluge S. Searching for acceptance: Challenges encountered while raising a child with autism. J Intellect Dev Disabil 2009; 34(2): 142-52. Kousha M, Attar HA, Shoar Z. Anxiety, depression, and quality of life in Iranian mothers of children with autism spectrum disorder. J Child Health Care 2016; 20(3): 405-14. [http://dx.doi.org/10.1177/1367493515598644]. Caicedo C. Families with special needs children: Family health, functioning, and care burden. J Am Psychiatr Nurses Assoc 2014; 20(6): 398-407. Falk NH, Norris K, Quinn MG. The factors predicting stress, anxiety and depression in the parents of children with autism. J Autism Dev Disord 2014; 44(12): 3185-203. [http://dx.doi.org/10.1007/s10803-014-2189-4]. Cantwell J, Muldoon OT, Gallagher S. Social support and mastery influence the association between stress and poor physical health in parents caring for children with developmental disabilities. Res Dev Disabil 2014; 35(9): 2215-23. [http://dx.doi.org/10.1016/j.ridd.2014.05.012]. Weiss MJ. Harrdiness and social support as predictors of stress in mothers of typical children, children with autism, and children with mental retardation. Autism 2002; 6(1): 115-30. Gray DE. “Everybody just freezes. Everybody is just embarrassed”: Felt and enacted stigma among parents of children with high functioning autism. Sociol Health Illn 2002; 24: 734-49. Lutz HR, Patterson BJ, Klein J. Coping with autism: A journey toward adaptation. J Pediatr Nurs 2012; 27(3): 206-13. Shin J, Nhan NV, Crittenden KS, Hong HT, Flory M, Ladinsky J. Parenting stress of mothers and fathers of young children with cognitive delays in Vietnam. J Intellect Disabil Res 2006; 50(Pt 10): 748-60. Werner S, Shulman C. Subjective well-being among family caregivers of individuals with developmental disabilities: The role of affiliate stigma and psychosocial moderating variables. Res Dev Disabil 2013; 34(11): 4103-14. Ludlow A, Skelly C, Rohleder P. Challenges faced by parents of children diagnosed with autism spectrum disorder. J Health Psychol 2012; 17(5): 702-11. Duarte CS, Bordin IA, Yazigi L, Mooney J. Factors associated with stress in mothers of children with autism. Autism 2005; 9(4): 416-27. Kobasa SC. Stressful life events, personality, and health: An inquiry into hardiness. J Pers Soc Psychol 1979; 37(1): 1-11. Perry A. A model of stress in families of children with developmental disabilities: Clinical and research applications. J Dev Disabil 2004; 11(1): 1-16. Boyd BA. Examining the relationship between stress and lack of social support in mothers of children with autism. Focus Autism Other Dev Disabl 2002; 17: 208-15. Hastings RP. Parental stress and behaviour problems of children with developmental disability. J Intellect Dev Disabil 2002; 27: 149-60. Dykens E, Hodapp R, Evans D. Profiles and development of adaptive behavior in children with down syndrome. Down Syndrome Res and Pract 2006; 9: 45-50. Dietz LJ, Jennings KD, Kelley SA, Marshal M. Maternal depression, paternal psychopathology, and toddlers’ behavior problems. J Clin Child Adolesc Psychol 2009; 38(1): 48-61. Hall HR, Graff JC. The relationships among adaptive behaviors of children with autism, family support, parenting stress, and coping. Issues Compr Pediatr Nurs 2011; 34(1): 4-25. [http://dx.doi.org/10.3109/01460862.2011.555270]. Rodriguez CM. Association between independent reports of maternal parenting stress and children’s internalizing symptomatology. J Child Fam Stud 2011; 20: 631-9. [http://dx.doi.org/10.1007/s10826-010-9438-8]. Stone LL, Mares SH, Otten R, Engels RC, Janssens JM. The co-development of parenting stress and childhood internalizing and externalizing problems. J Psychopathol Behav Assess 2016; 38: 76-86. Kerig P, Ludlow A, Wenar C. Developmental psychopatology: From infancy through adolescence 6th ed. 2012. Drapela LA, Baker DL. Policy awareness, financial hardship, and work impact : Correlates of negative experiences with health care providers and health care insurers among caregivers of children with autism spectrum disorder. SAGE Open 2014; 4: 1-13. Gargiulo R. Special education in contemporary society: An introduction to exceptionality 2010. Plotkin RM, Brice PJ, Reesman JH. It is not just stress: parent personality in raising a deaf child. J Deaf Stud Deaf Educ 2014; 19(3): 347-57. Conners FA, Rosenquist CJ, Arnett L, Moore MS, Hume LE. Improving memory span in children with Down syndrome. J Intellect Disabil Res 2008; 52(Pt 3): 244-55. Gupta S, Rao BK, S D K. Effect of strength and balance training in children with Down’s syndrome: A randomized controlled trial. Clin Rehabil 2011; 25(5): 425-32. Dykens EM, Shah B, Sagun J, Beck T, King BH. Maladaptive behaviour in children and adolescents with Down’s syndrome. J Intellect Disabil Res 2002; 46(Pt 6): 484-92. Hayat I, Zafar M. Relationship between psychological well being and coping strategies among parents with down syndrome children. Int J Humanit Soc Sci 2015; 7: 109-17. American Psychiatric Association. Diagnostic and statistical manual of mental disorders 5th edition. (DSM-5 TM). 2013. Davis NO, Carter AS. Parenting stress in mothers and fathers of toddlers with autism spectrum disorders: Associations with child characteristics. J Autism Dev Disord 2008; 38(7): 1278-91. Konst MJ, Matson JL, Turygin N. Exploration of the correlation between autism spectrum disorder symptomology and tantrum behaviors. Res Autism Spectr Disord 2013; 7: 1068-74. Zaidman-Zait A, Mirenda P, Duku E, et al. Impact of personal and social resources on parenting stress in mothers of children with autism spectrum disorder. Autism 2017; 21(2): 155-66. [http://dx.doi.org/10.1177/1362361316633033]. Ben-Sasson A, Hen L, Fluss R, Cermak SA, Engel-Yeger B, Gal E. A meta-analysis of sensory modulation symptoms in individuals with autism spectrum disorders. J Autism Dev Disord 2009; 39(1): 1-11. Gohel M, Mukherjee S, Choudhary S. Psychosocial impact on the parents of mentally retarded children in Anand district. Healthline (Bhavnagar) 2011; 2: 62-6. Gupta V. Comparison of parenting stress in different developmental disabilities. J Dev Phys Disabil 2007; 19: 417-25. Hayes SA, Watson SL. The impact of parenting stress: A meta-analysis of studies comparing the experience of parenting stress in parents of children with and without autism spectrum disorder. J Autism Dev Disord 2013; 43(3): 629-42. Daulay N. Model of parenting stress in Indonesian mothers of children with autism. PhD diss 2018. Sarafino E, Smith T. Health psychology: Biopsychosocial interactions 2014. Sparrow S, Cicchetti D, Balla D, Doll E. Vineland adaptive behavior scales: Survey forms manual 2nd ed. 2005. Johnston C, Mash E. A measure of parenting satisfaction and efficacy. J Clin Child Psychol 1989; 18: 167-75. Abidin RR. Parenting stress index-profesional manual 3rd ed. 1995. Hair J, Anderson R, Tatham R, Black W. Multivariate data analysis with reading 5th ed. 1998. Hair J, Black W, Babin B, Anderson R. Multivariate Data Analysis 7th ed. 2014. Hayes AF, Preacher KJ. Statistical mediation analysis with a multicategorical independent variable. Br J Math Stat Psychol 2014; 67(3): 451-70. Hastings RP, Kovshoff H, Ward NJ, degli Espinosa F, Brown T, Remington B. Systems analysis of stress and positive perceptions in mothers and fathers of pre-school children with autism. J Autism Dev Disord 2005; 35(5): 635-44. Hill C, Rose J. Parenting stress in mothers of adults with an intellectual disability: Parental cognitions in relation to child characteristics and family support. J Intellect Disabil Res 2009; 53(12): 969-80. Teti DM, Gelfand DM. Behavioral competence among mothers of infants in the first year: The mediational role of maternal self-efficacy. Child Dev 1991; 62(5): 918-29. Ingersoll B, Hambrick DZ. Disorders the relationship between the broader autism phenotype, child severity, and stress and depression in parents of children with autism spectrum disorders. Res Autism Spectr Disord 2011; 5: 337-44. Samadi SA, McConkey R, Bunting B. Parental wellbeing of Iranian families with children who have developmental disabilities. Res Dev Disabil 2014; 35(7): 1639-47. Norizan A, Shamsuddin K. Predictors of parenting stress among Malaysian mothers of children with Down syndrome. J Intellect Disabil Res 2010; 54(11): 992-1003. Harrington R. Stress, Health, and Well-being: Thriving in the 21st Century 2013. Ben-Zur H, Duvdevany I, Lury L. Associations of social support and hardiness with mental health among mothers of adult children with intellectual disability. J Intellect Disabil Res 2005; 49(Pt 1): 54-62. Horner RH, Carr EG, Strain PS, Todd AW, Reed HK. Problem behavior interventions for young children with autism: A research synthesis. J Autism Dev Disord 2002; 32(5): 423-46. [http://dx.doi.org/10.1023/A:1020593922901]. Macias MM, Roberts KM, Saylor CF, Fussell JJ. Toileting concerns, parenting stress, and behavior problems in children with special health care needs. Clin Pediatr (Phila) 2006; 45(5): 415-22. Hepburn SL, Maclean WE. Maladaptive and repetitive behaviors in children with down syndrome and autism spectrum disorders : Implications for screening. J Ment Health Res 2009; 2: 67-88. [http://dx.doi.org/10.1080/19315860802627627]. Hall HR, Graff JC. Maladaptive behaviors of children with autism: Parent support, stress, and coping. Issues Compr Pediatr Nurs 2012; 35(3-4): 194-214. Lai WW, Goh TJ, Oei TP, Sung M. Coping and well-being in parents of children with Autism Spectrum Disorders (ASD). J Autism Dev Disord 2015; 45(8): 2582-93. Webster-Stratton C. Stress: A potential disruptor of parent perceptions and family interactions. J Clin Child Psychol 1990; 19(4): 302-12. Sigel ie, McGillicuddy-De L. Ann V. Parent beliefs are cognitions: The dynamic belief systems model.Status and social conditions of parenting 2nd ed. Handbook of parenting32002; : 485-508. Hassall R, Rose J, McDonald J. Parenting stress in mothers of children with an intellectual disability: The effects of parental cognitions in relation to child characteristics and family support. J Intellect Disabil Res 2005; 49(Pt 6): 405-18. Ponomartchouk D, Bouchard G. New mothers’ sense of competence: Predictors and outcomes. J Child Fam Stud 2015; 24: 1977-86. Mash E, Johnston C. Determinants of parenting stress: Illustrations from families of hyperactive children and families of physically abused children. J Clin Child Psychol 1990; 19: 313-28. Maddi SR. Hardiness: The courage to be resilient.Comprehensive handbook of personality and psychopatology: Personality and everyday functioning 2006; Vol. 1: 306-21. Karst JS, Van Hecke AV. Parent and family impact of autism spectrum disorders: A review and proposed model for intervention evaluation. Clin Child Fam Psychol Rev 2012; 15(3): 247-77. Dominick KC, Davis NO, Lainhart J, Tager-Flusberg H, Folstein S. Atypical behaviors in children with autism and children with a history of language impairment. Res Dev Disabil 2007; 28(2): 145-62. Konstantareas MM, Stewart K. Affect regulation and temperament in children with Autism Spectrum Disorder. J Autism Dev Disord 2006; 36(2): 143-54. Prizant B, Wetherby A. Critical issues in enhancing communication abilities for persons with autism spectrum disorders.Volume Two: Assessment, intervention, and policy 3rd ed. Handbook of autism and pervasive developmental disorders2005; 925-45. Nezu A, Nezu C. Problem solving therapy. J Psychother Integration 2001; 11: 187.